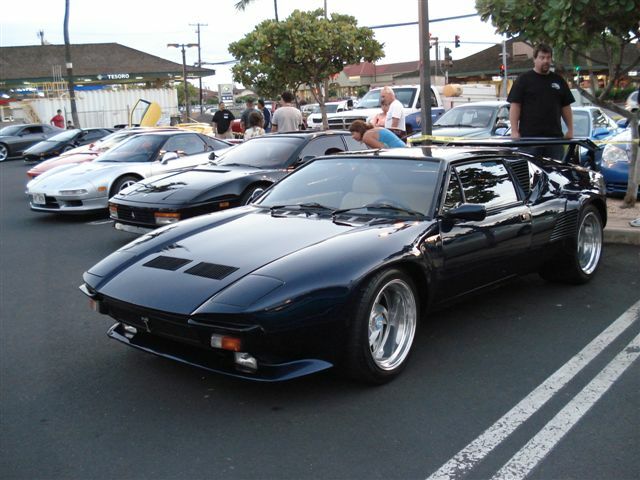 I've been actively looking for a Pantera GT5-S. I've been sending out some e-mails and contacting some people searching. Anyway, Mike Haber at ProAuto told me that the guy who currently owns Glen Pascal's GT5-S is open to the idea of selling it. I was told that Glen Pascal was a prominent member of the Pantera community and that this car is well known. Apparently it was a show car that won several trophies and it used to have a fontana aluminum block. The fontana block has since been pulled out and the original motor put back in. Are any of you guys familiar with this car? Any opinions of this car? The car is currently in Hawaii..a long haul for me to go take a look. And I wouldn't even know what I was looking at anyway. Any opinions of this car from people who are familiar with it would be greatly appreciated. Yes that is the car. It is not officially for sale. But apparently Mike Haber has already spoken to the owner in Maui and I may be able to buy it. Do you know this car? Is this a very nice car in good condition that would be reliable to drive? That car was sold by Mike about a year ago so it's not been there in Hawaii too long. The car has been really nicely redone and as long as you're not looking for a bone-stock GT5-S, I don't think this car will be a disappointment. The color on it is spectacular and really goes well with the light buff interior. The only part of the car that isn't stunning is the rather odd Coddington wheels. I would ditch the wing if it was mine and I regret not acting faster when I saw it for sale previously. I recall seeing this car for sale too late fall time and it struck me at the time as an extremely nice car and priced to sell. I do like the deep blue. What was it listed at $? It was featured in POCA a few years ago, perhaps 5 years ago? So if it really does look like a deal may take place someone could probably scan the article for you or something to give you a little history of the car. I presently own a GT5 car that was done by Glenn Pascall. It has similar Coddington wheels and the same silly aluminum a-arm covers along with other useless bling that I eliminated when I retored it. My observation is that Glenn spent more time on the bling end of things than mechanical or electrical perfection. Of course, it is the former that the less informed will pay for. I'll glsadly sell the wheels to another who finds them attractive. Congratulations JT. I was very interested in that car but found out a bit too late. The color and interior are gorgeous, but I found it a shame that the car had been so "resto-modded", considering the rarity of a 5S. Glad to see she made it into caring hands and I hope you will be kind enough to post some large photos when you are finished (if not already) the restoration.